First Series from Bestselling Author Julie Klassen! On a rise overlooking the Wiltshire countryside stands the village of Ivy Hill. Its coaching inn, The Bell, is its lifeblood--along with the coach lines that stop there daily, bringing news, mail, travelers, and much-needed trade. Jane Bell lives on the edge of the inn property. She had been a genteel lady until she married the charming innkeeper who promised she would never have to work in his family's inn. But when he dies under mysterious circumstances, Jane finds herself The Bell's owner, and worse, she has three months to pay a large loan or lose the place. Feeling reluctant and ill-equipped, Jane is tempted to abandon her husband's legacy and return to her former life of ease. However, she soon realizes there is more at stake than her comfort. But who can she trust to help her? Her resentful mother-in-law? Her husband's brother, who wanted the inn for himself? Or the handsome newcomer with secret plans of his own . . . ? With pressure mounting from the bank, Jane struggles to win over naysayers and turn the place around. Can Jane bring new life to the inn, and to her heart as well? Before you tar and feather me for giving a Julie Klassen book a three star rating, please hear me out. As stated in my rating system post, "This is reserved for books that I look upon with pleasure, but do not produce the feelings of complete adoration." The Innkeeper of Ivy Hill was unique and enjoyable to read, however it did not move my soul. The first thing that I noticed about this book that is different from any other of Mrs. Klassen's books, is the the point of views are strictly female. Alternating between three women, we get a unique look into life in a small village set in England during 1820. I learned a lot about the inner workings of the inn and got explore the lives of these different women who represent very different personalities and stations in life. Reading through the eyes of these three women also added an extra sense of mystery. Because we don't know what is going on in the minds of the gentlemen in this story. Julie Klassen does take on some heart wrenching topics in this book. Specifically, difficulties with pregnancies. I will not sugar coat it, descriptions are detailed and quite graphic in my opinion. Please proceed as you feel appropriate. I just know that for myself, it was difficult to read those scenes and I feel it only fair to give my fellow readers a heads up. I never had any complications with pregnancy, but have had a lot of medical trauma with our second son, during and after delivery(everything is OK now). Therefore, I find it hard to read about anything at all happening to children in books. 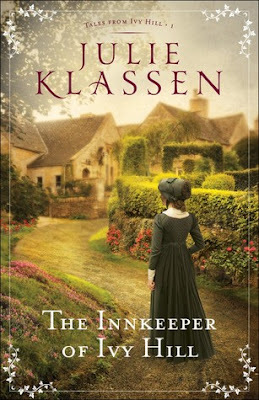 Overall, I enjoyed Mrs. Klassen's book in her very first series and I will read the next books. The Innkeeper of Ivy Hall was an entertaining book and I look forward to what comes next. I received a complimentary copy of The Innkeeper of Ivy Hill through NetGalley. I was not required to write a positive review. All opinions expressed are mine alone. JULIE KLASSEN loves all things Jane--Jane Eyre and Jane Austen. A graduate of the University of Illinois, Julie worked in publishing for sixteen years and now writes full-time. Three of her books, The Silent Governess, The Girl in the Gatehouse, and The Maid of Fairbourne Hall, have won the Christy Award for Historical Romance. The Secret of Pembrooke Park was honored with the Minnesota Book Award for genre fiction. Julie has also won the Midwest Book Award and Christian Retailing's BEST Award, and has been a finalist in the Romance Writers of America's RITA Awards and ACFW's Carol Awards. Julie and her husband have two sons and live in a suburb of St. Paul, Minnesota. Hehe...Thank you! I am looking forward to reading your review!!! Thank you Caryl!!! That means a lot to me!